That means these recipes give even small children the opportunity to participate in the cooking from start to finish, according to their abilities. Kids love to measure ingredients. So don’t overlook the task of transferring a cup of sugar to the dough bowl, or selecting a handful of nuts. Emptying any kind of bag, jar, spoon or bowl into the food that’s being prepared is an important part of the sous chef’s expertise. Young sous chefs are usually also very good at mixing ingredients, whether that’s done with a spoon or by diving in with both hands. Measuring tasks often come with a bit of mess and a few wasted ingredients, but that’s a small price to pay for success. 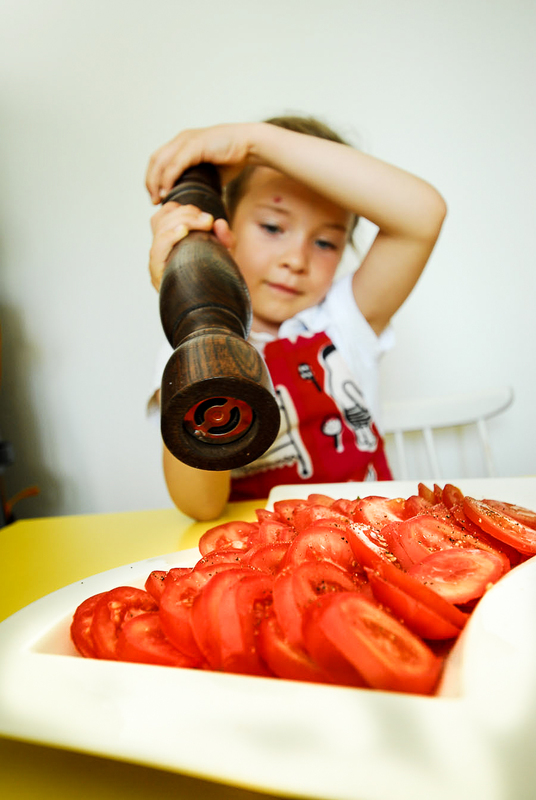 Even a small child can help with frying – with certain reservations. The pan should be robust and have high edges. The best frying utensil for the young assistant is a plastic ladle or a fork-like, sturdy turner. Children should only fry ingredients which don’t splash grease while frying and don’t stick to the pan easily. For example mushrooms and other food that contain a lot of water are good for frying without fat. Sous chefs can also sauté vegetables in oil. A robust chair or, preferably, a stepladder with handrails can be used to stand on. It is also important to carefully instruct the children on how to support themselves, and how they should grip the pan so that they don’t hurt themselves. Never leave your assistants by themselves at the stove! 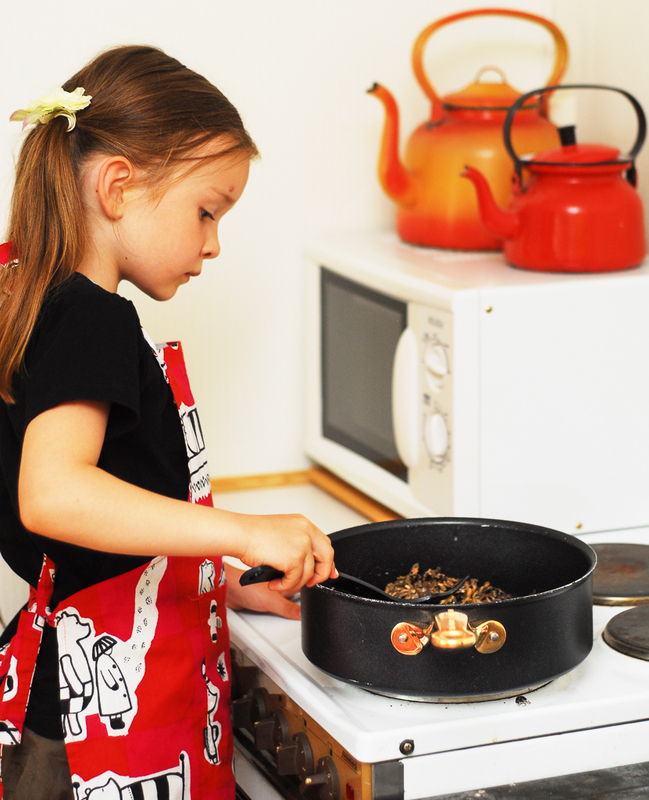 Especially with the youngest sous chefs, it is advised that the adult holds the pan as the next generation takes care of the actual frying task – just to be on the safe side. Sharp knives are best left with the older chefs. But there are a lot of ingredients that can be chopped with a regular table knife: for example cooked potatoes, button mushrooms, melon and roasted peppers. Fresh herbs are one of the favorite ingredients of sous chefs. Scissors are the best utensil for tiny hands chopping up herbs. The young assistant can either cut the herbs, or begin by tearing the leaves into a small bowl and chop them in the bowl. There’s no need to fuss about the size of the herbs; the important thing is to chop the herb that’s needed for the recipe. 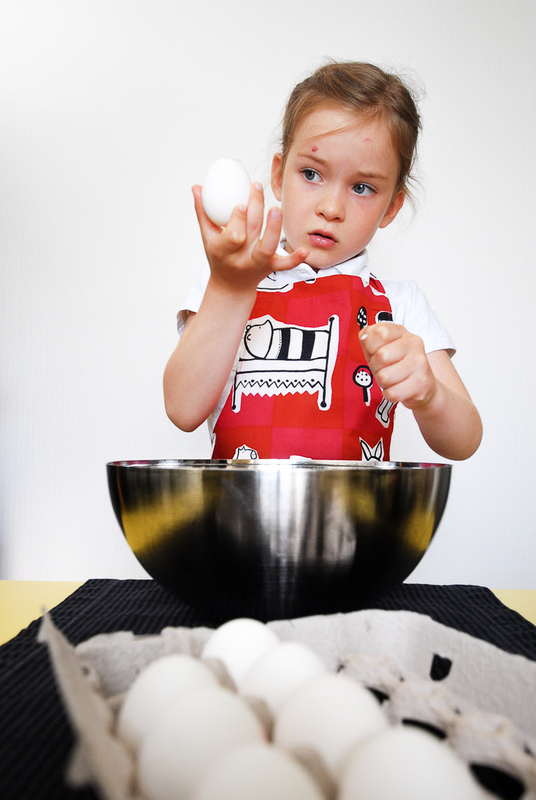 Breaking eggs is one of a sous chef’s favorite tasks. You can do the first one together. More advanced assistants can even separate the egg whites and yolks. 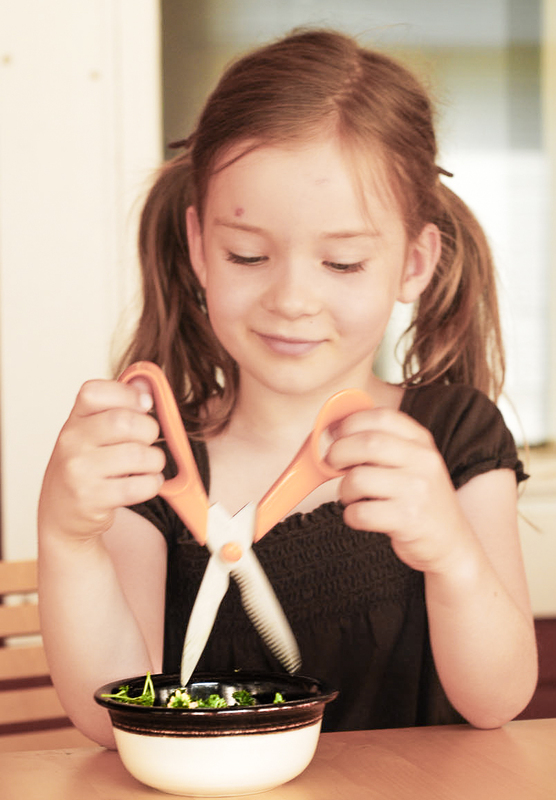 Squeezing lemons is also something children can manage by themselves, as long as the lemon has been cut into sturdy wedges that fit in small hands. The best utensils are a citrus drill, which fits in small hands very well, or a traditional, hand-held lemon squeezer. Garnishing nearly-ready dishes, and especially desserts, is where most sous chefs shine. Let the kids free their imagination, or try to steer them into a particular direction. How do you peel a shrimp? How do you clean mushrooms? 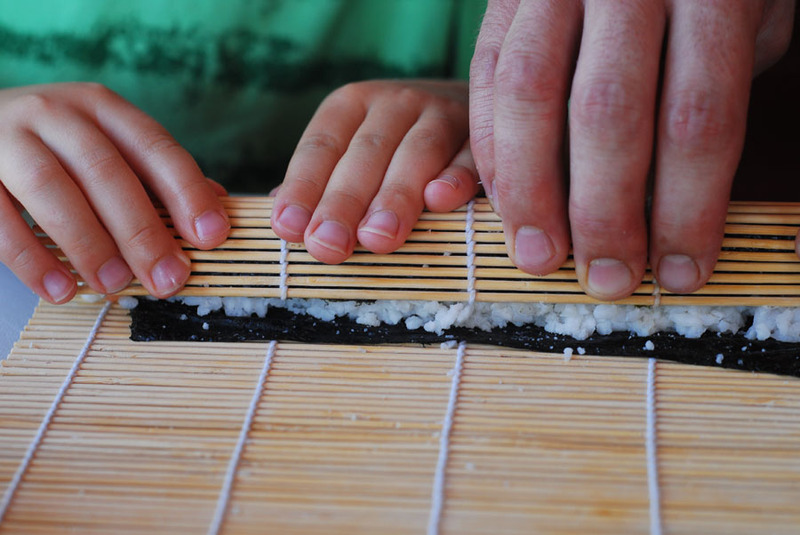 Some tasks require skilled fingers or at least some guidance, and what’s more fun than to sit down and do them together? Of course, any part of the recipe that is suited for the sous chef can be done together with the adult. No flavors have been shunned in this cookbook, because children learn to eat different foods precisely as adults do: by trying and tasting. You don’t have to like everything, but there’s no need to make a big deal about it. Sometimes you can cook a starter with new flavors just for tasting – and for the other (adult) diners.